Contrary to your initial impressions, shopping for the right shower head isn’t as simple as it sounds. Well, we’re not saying that it is something you cannot do on your own; it’s just that many people have regretted purchasing the incorrect one for their bathrooms for the simple reason that they didn’t know what they were doing when they went for shopping. 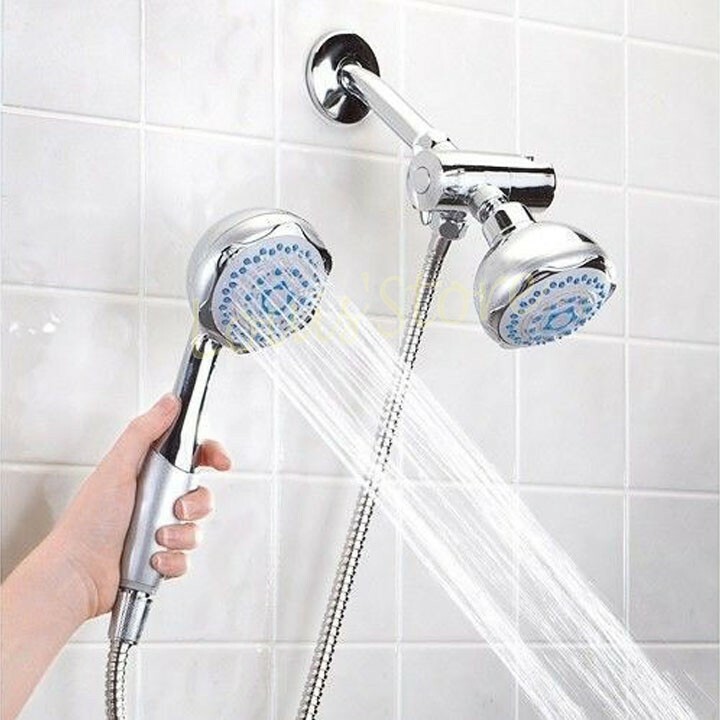 Because of the existence of modern and sophisticated shower heads, the job of purchasing one has become a bit more difficult or challenging than usual. But as a homeowner who wants both convenience and the ability to save water in the shower, it is your job to learn the types, including their advantages and disadvantages. So let’s find out what your options are in this article. First off, Angieslist.com defines the three most common varieties that are likely to be chosen by a typical homeowner like you. The traditional shower head, a single spray shower head, comes standard in most bathroom remodels. These less expensive shower heads usually include an adjustable nozzle to change the water spray patterns, making it customizable for several users. Single spray shower heads typically cost from $5 to $50, but the price can increase slightly depending on the shower head finish. A rain shower head, a more recent trendy bathroom remodeling idea, imitates rainfall. These large, flat shower heads spread the same amount of water from a typical shower head over a larger surface area, which reduces the amount of water pressure hitting your body. A rainfall shower head purchased from a store can cost less than $100, but many high quality fixtures can cost up to $500. Handheld shower heads offer great flexibility. These shower heads detach from the wall and come with long hoses, which allow users to rinse hard-to-reach areas. They also work great in seated showers or for users who have limited mobility. A handheld shower head system typically costs between $30 and $150. Read the original post through this link. If you want easy and convenient installation, plus the benefit of having a proven shower head type, those three are your safest options. Likewise, the great thing about those three is that you won’t be spending a lot to purchase them. In fact, the most expensive variety among the three, the rain shower head could only cost as much as $500, but the typical price is below $100. Next, let’s go to BobVila.com, where an article called “Shower Heads 101” talks about the environmental considerations when buying shower heads, as well as the other factors that are deemed essential to weigh on right before you start thinking about shopping for a new one. Since the early 1990s, the EPA has limited shower heads in the U.S. to a flow rate of 2.5 gallons per minute (gpm), thereby conserving both water and the fuel that runs water heaters. Knowing that the average family goes through almost 400 gallons of water in a single day, consider investing in a water-saving shower head that uses even less than 2.5 gpm. Models that carry the EPA WaterSense label have been demonstrated to utilize no more than 2 gpm. Going the green route? Take your homes water pressure into account. The EPA-specified flow rate is for a standardized pressure of 80 pounds per square inch (psi), so if your water pressure is not that high to begin with, a low-flow shower head probably wont offer the results youre seeking. In fact, if youre already unsatisfied with the water pressure in your home, concentrate on models that have been specially engineered to mitigate that issue. To upgrade your shower, you can spend anywhere from $5 to $1,000 and beyond. Decide for yourself whether special features that tip the price scale are worth the expense. When comparing two models with similar feature sets, keep in mind that a higher price does not always indicate a higher level of quality. Who is going to use the bathroom youre updating? If its the master bath and you dont plan on sharing the space with guests, do whatever you like. If its a bathroom that visitors to your home are likely to use, select from those models that are easiest to use. In addition, think about how much time and energy you wish to spend on installing your shower head. If youre renovating the bathroom or building a new home, the course of work already being done might easily absorb an otherwise demanding installation. For a weekend afternoon project, basic wall-mounted fixtures are most accessible for do-it-yourselfers. You will get more from the same article by clicking this link here. In the end, the most important feature or attribute you should be looking at when buying a new shower head is functionality. Although this type of plumbing fixture adds beauty to the bathroom, you can’t just purchase one simply because it looks beautiful. There’s no point in installing one when it won’t give you the function it is designed for.